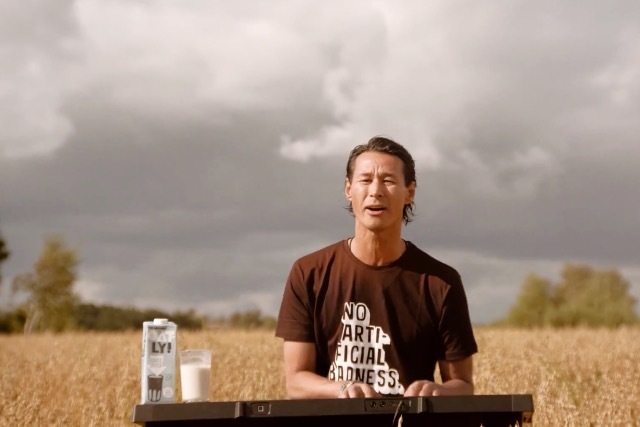 Marketers rejoice - finally here's a CEO who not only 'gets' marketing, but who is so involved in his brand's advertising that he has penned a song, grabbed his 80s synthesiser, set it up in a field and crooned the words "Wow, wow, no cow" to promote Swedish oat-based milk alternative Oatly. The boss is Oatly's Toni Peterrson and he is about as far removed from the notion of a stuffed shirt as you can get. The song he sings is aptly called ‘Wow No Cow’. In the 75-second spot, he stabs out some chords and sings: "It’s alright, it’s like milk… but made for humans" with the track building and the synth’s tinny beat kicking in. Oatly, which is available in UK supermarkets, has stirred up some controversy in its native Sweden with the tenor of claims such as "it’s like milk, but made for humans" raising the hackles of the Swedish Dairy Association, which is in the process of taking legal action to gag Oatly’s claims. The film is episode six in a series of 20 that will eventually all be posted on Oatly’s YouTube channel.